If you are planning go to New Zealand you probably will rent camper van or car to travel around this amazing country. Of course you know they drive on left side of road. It could feel a little bit weird if you are from “right side” country, but you shouldn’t worry too much about that. You’ll adjust to this in no time. In your car will be sign “Keep left” as reminder in case you’ll forget it by looking to scenery. In most tourist places you’ll find signs on the road with arrows which side to drive. So no worries. But there is one road rule you won’t find in any other country. It is so-called right-hand rule. 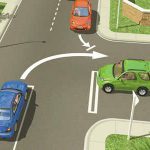 It requires that cars turning left must wait to give way to those vehicles turning in front of them from the right. There are plans to change this rule. Although about these plans was already written some time ago, but rule still in force, so keep in mind it and obey it.